Red Chevron is the new crave for all bow lovers. 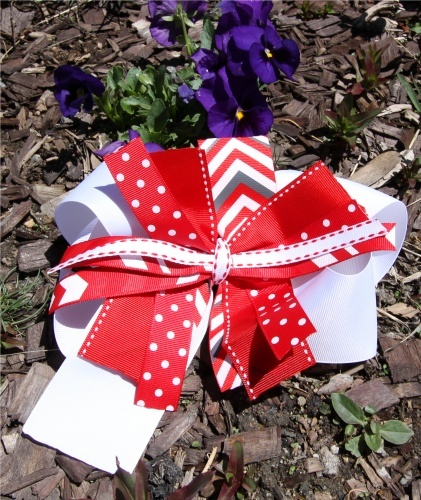 This pinwheel style bow has chevron stripes and polka dots just streaming out all over. The base is a 2.25" white grosgrain ribbon that has a front tail long enough for a first initial to be added on or keep plain as shown above. The pinwheel has different size ribbons of red with white polka dots, red with white moon stitches and red and gray chevron stripes. This is an over sized base bow of 50" and 119" of ribbon in the pinwheel so this bow is loaded with goodies. The red chevron will match all of your new chevron outfits!